Sometimes I am asked, “When are the best times to shop?” For spring/summer, the time is NOW. Actually, it is a little late in the sale season now. Sales have been going for at least a month or more; however, we are now in prime time for final markdowns, which is when you find your best deals (but there is also less selection). The other question I am occasionally asked, “Where do you like to shop?” My broad answer to this question is “everywhere.” I pick up finds at vintage shops, boutiques and “regular” mall stores. I also enjoy shopping when I travel because when I purchase pieces outside of Dallas I have a greater chance of having things no one else will have in their wardrobes. (1) Nordstrom Northpark is where I pick up work basics like cardigans, pencil skirts and trousers. Ask for Jennifer Parsons to assist you. She stays very busy, so if she is not available to assist you, she can set you up to shop with one of the store’s other personal stylists. Shopping with a personal stylist is a service offered free of charge by Nordstrom, and it is a service I highly recommend. It is a great time-saver, and their stylists have the eye for what looks good. (2) Tootsies is where I like to pick up pieces that are one step beyond basic like printed jeans, colorful blouses and funky jewelry. Ask for Pat or Betsy to assist you. They are fun and knowledgeable about the store’s merchandise, and they are also honest about what looks good and what pieces can be tailored to fit well. Here are my finds from this week’s consolidation sale, which ends tomorrow: J. 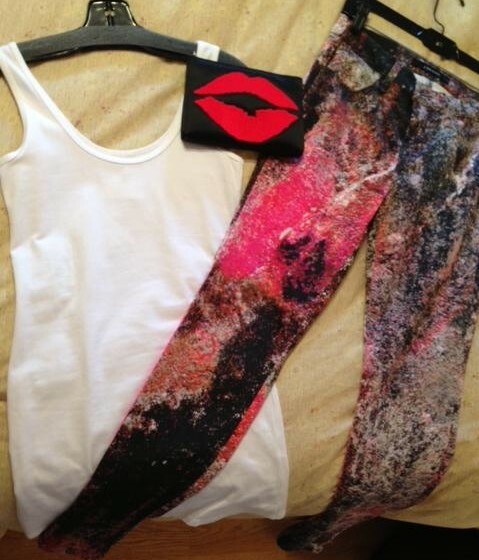 Brand printed jeans (love! ), three dots white tank top (a basic I needed) and a Lulu Guiness cosmetic case (I had been looking for a new case for my handbag for months). (3) Elements is where I shop for cool wardrobe treasures, pieces I know I will have for many years and love wearing because of their unique design. Elements carries lines you may not have heard of, but you think you should like Mackage and Plein Sud. Ask for Stevie. She’s a brilliant stylist, always spot on with what works for you, and she’s just plain cool. 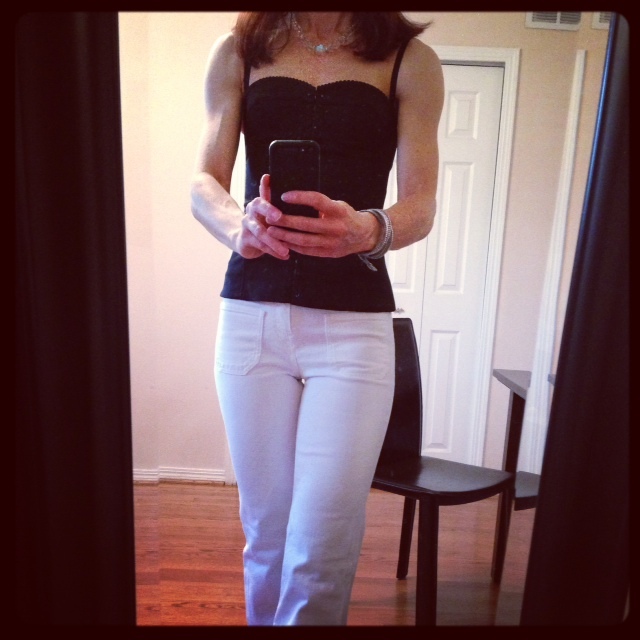 Here I am wearing a pair of high-waist, white flair jeans by Notify I snagged at their final markdown sale last August. When Stevie said I look like Olivia Newton John in these jeans, I practically threw my dollars at her feet. (4) Forty Five Ten is a shop you may be afraid to go into because they carry the top designer goods, and they are repeatedly featured in fashion magazines like Harper’s Bazaar and Elle. However, if you have all of your wardrobe basics covered and you would like to start adding designer pieces to your “collection,” this is the place to go. Their final markdown is the time to go if you have a limited budget (as I do). 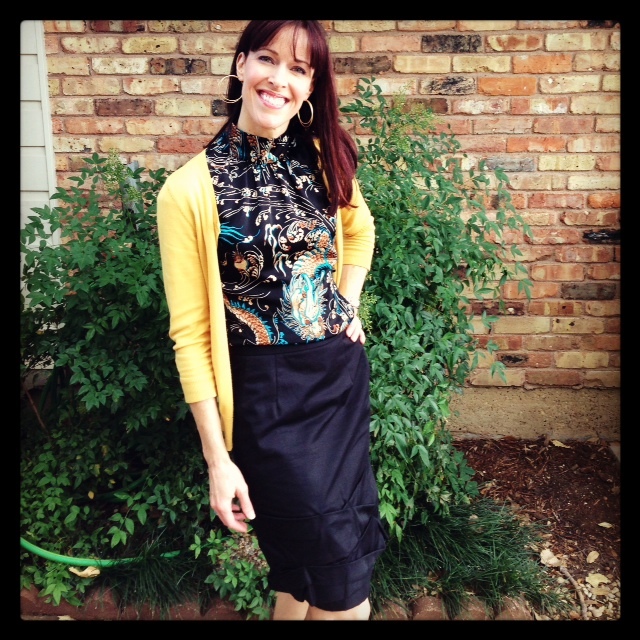 Here I am wearing a Comme des Garcon skirt I purchased at this year’s final markdown sale. Lastly (but certainly not least), I would like to give a shout-out to Lou Lou, located across the street from Elements on Lovers Lane. They carry all kinds of fun shoes and great handbags at prices that won’t break your bank. The owner Molly Thayer Justman, a fellow Louisiana girl, has the eye for what we’ll love having in our wardrobes. To close, I must brag on my finds from Gap this week. I ha ve enjoyed my cotton pants I’ve bought there the last two summers, so I decided to go in this week to see if I could get another pair for a good price. 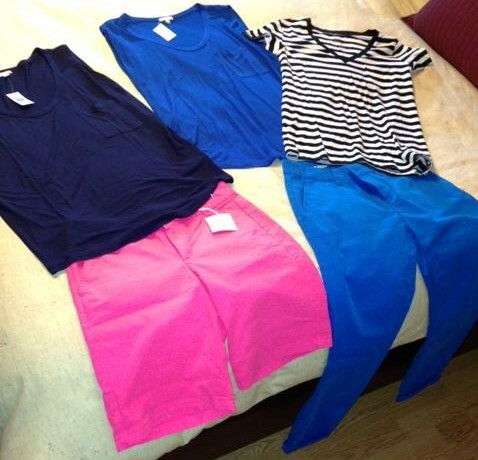 Well, I not only found another pair of cotton pants (in cobalt blue, no less), but I also scored three tops and a pair of hot pink shorts. All five pieces rang up for a grand total of $67, including tax. Wow! So, there you have it – Bethany’s shopping haunts revealed. Nothing too exotic or crazy is on the list, as you can see. The key is knowing what you want and need, and being sure of your brand and what pieces will best communicate it. If you need help, let me know. I’d be delighted to assist you!